Carpenter Ants are active foragers, traveling great distances in search of food. Even colonies established outdoors may send worker ants inside structures to feed on a variety of items. 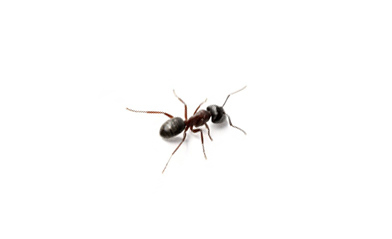 This ant species prefers areas in homes associated with wet or damp wood such as around water leaks or behind gutters. Although they don’t use wood for food, their activities can weaken a structure. Carpenter Ant bait is effective at reducing infestations, but a professional is needed to treat the main and satellite colonies. Preventative measures include correcting moisture issues, sealing cracks, and re-locating woodpiles.